I feel like I always struggle to write full marathon recaps. 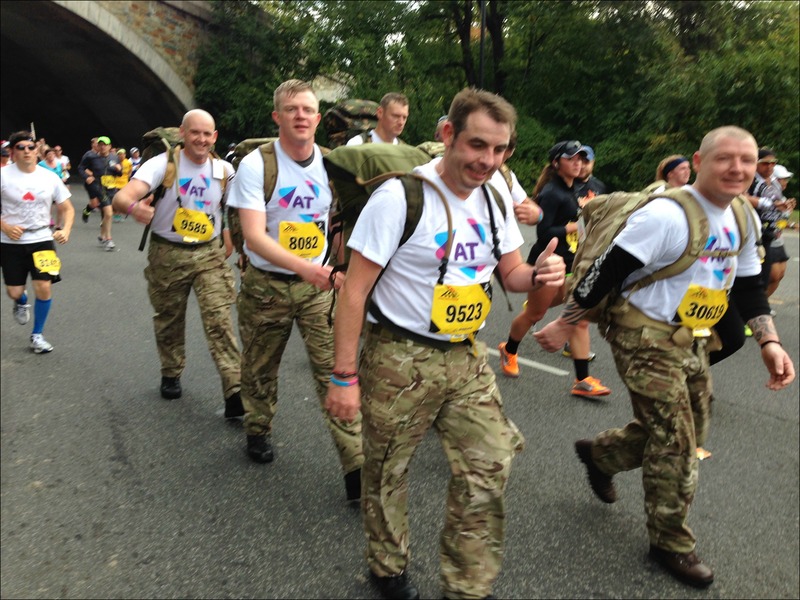 How do you write down the mental, emotional and physical experience of a 26.2 mile journey by foot?!? I personally really enjoy going back and re-reading my race recaps, I look at my blog as a sort of journal (albeit a journal open for the world to read! ), so that being said, apologies in advance for the very long recap, but I didn’t want to leave anything out. 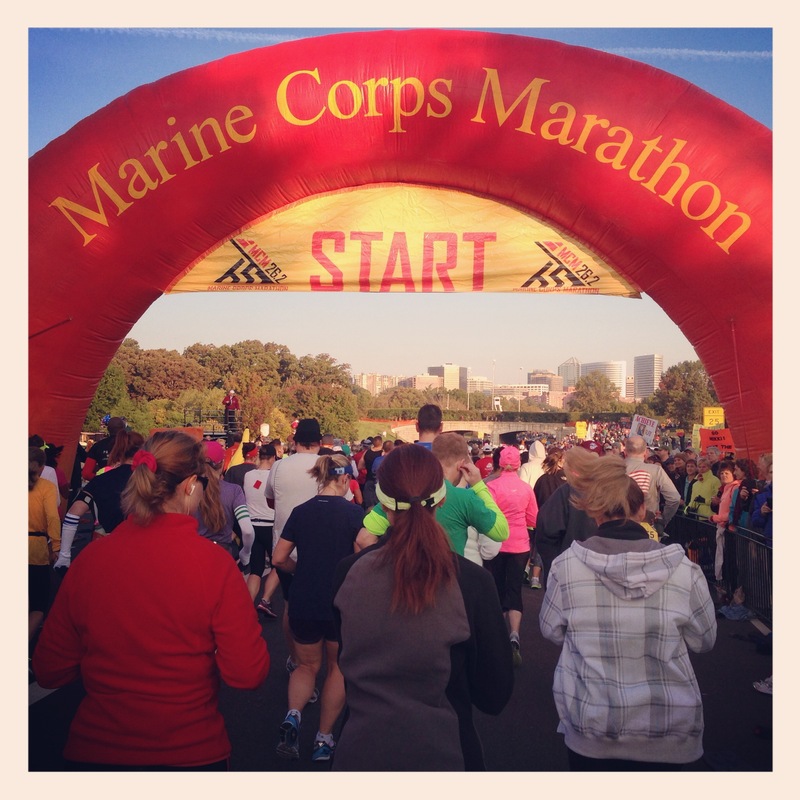 I want to go back and read this as I’m getting ready for my next marathon and be able to re-live the Marine Corps Marathon just as I remember it today. Good thing I lay all my clothes out the night before a race, because at 4:45am after a restless night of sleep there is no way I would be able to successfully dress myself and remember everything! I hopped on the metro (which was only a couple of blocks from my hotel) and ate my bagel with peanut butter and drank a Powerade on my way. At the Pentagon stop I followed all of the other runners for the walk over to the Runners Village starting area where I met up with Christine and Lisa who were both running their first marathon! …and making our way to the starting area. There were no formal corrals, only signs with estimated finish times and runners were expected to line up accordingly. From where we were (back by the 4:30-5:00 hour sign) we could’t even see the starting line! The National Anthem was sung by the Liberty Voices (alumni of the Epcot Voices of Liberty!) 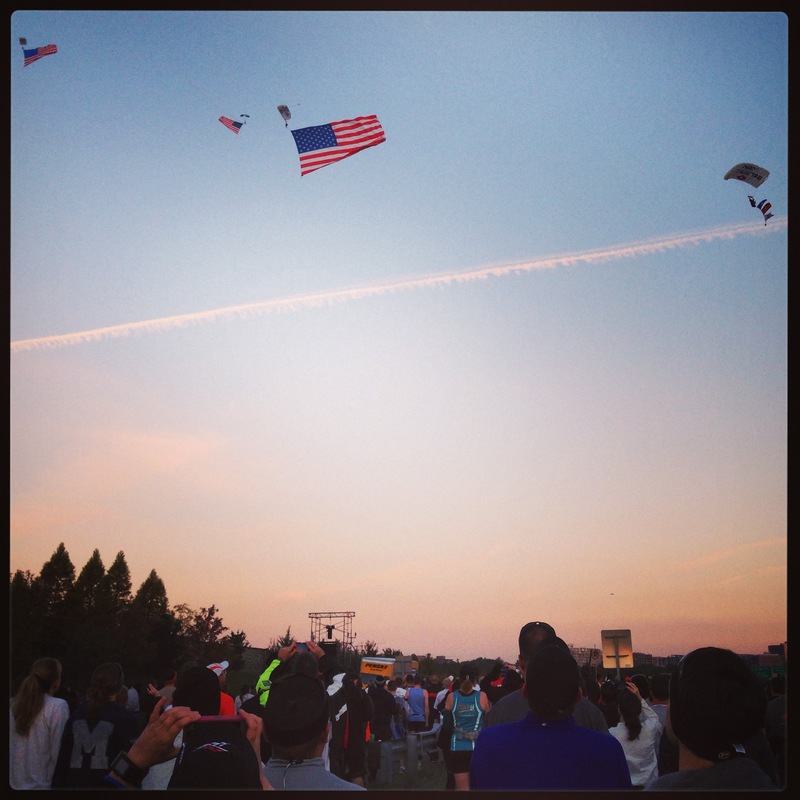 and everyone’s attention turned skyward as the American flag was parachuted in. It was such a beautiful way to start the race! The starting howitzer was blasted and we were off! Christine and I had talked back and forth the weeks leading up to the race and realized that we were both training around the same pace so we decided to start the race together and we’d see how it went. We agreed that we didn’t want to hold the other person back, so if one of us felt stronger at any point we were free to go. The start of the race was quite crowded and of course we immediately came to a nice big hill. Christine and I steadily climbed it and by the time we got to the top we were both ready to shed our throw away layer of clothes – it had definitely warmed up quick! Flag outside of a firehouse on that first hill! For those first few miles Christine and I chatted and weaved our way around the crowds. We fell into a comfortable rhythm and it was just like running with an old friend – except that Christine and I had actually only met once before and never had actually run together! It was really amazing how well it ended up working out! We saw my mom around mile 1, made our way across the Key Bridge and into Georgetown and then headed out onto Rock Creek for a few miles of an out and back part of the course. This part was pretty narrow and very congested so we weren’t quite able to keep up the pace we were hoping for, but I think it was around here that I began to think I wasn’t too concerned with my time goals, I was really enjoying just being a part of this incredible race. We passed the Kennedy Center and eventually ended up running along the Potomac River, which if I remember correctly is where the incredible military tribute was. …and immediately following that there was a section lined with flags, each with someone’s name hanging off of it. This part of the course was very quiet and reflective and again it made me think about how glad I was just to be a part of this event. This race was about more than just running 26.2 miles. We reached the halfway point of the run and Christine and I noted we were at 2 hours and 22 minutes. I was still well on track to PR my previous full marathon time, but my ultimate goal of 4:30 seemed a bit out of reach at this point. 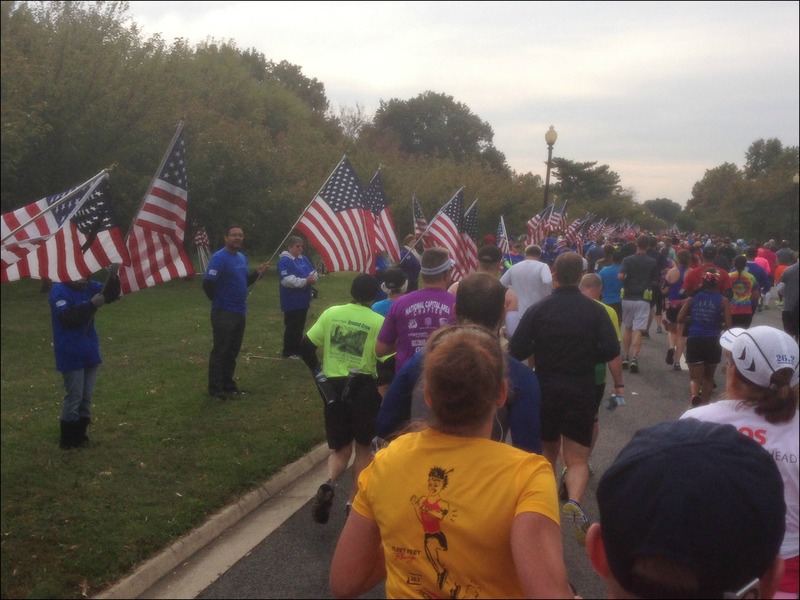 By miles 17 & 18 we were running along the National Mall and by the Capitol building. Christine and I couldn’t stop saying to each other how amazing it was! And honestly, I couldn’t believe how amazing I felt! I was on my own and I decided to give it all I had for that last 10k. Once I was over the bridge the course weaved through the streets of Crystal City and headed towards the Pentagon for the last few miles, but not before the famous Marine Corps Marathon Munchkin Stop! 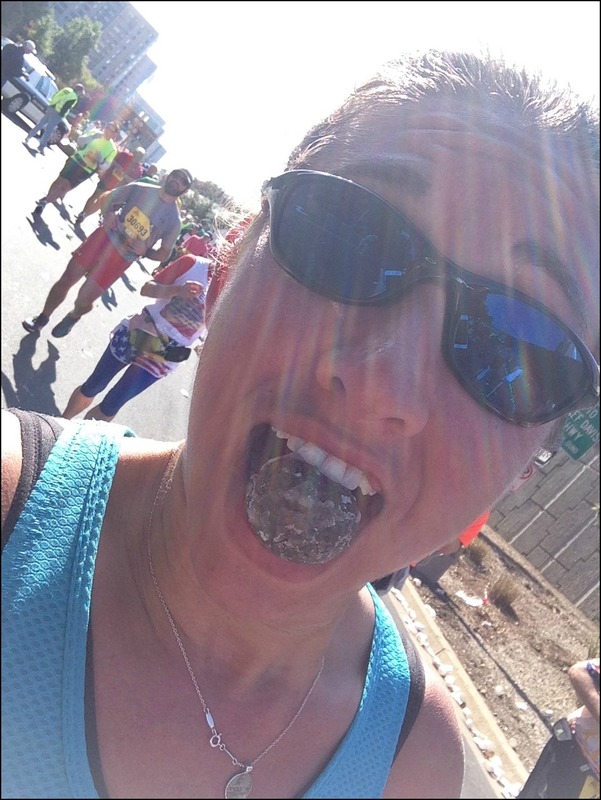 Yes, they serve munchkins at Mile 24 and it was one of my race goals to eat (and keep down!) a mile 24 munchkin! For the last 2 miles we were back on the highway before taking a quick left turn and coming face to face with THE HILL. 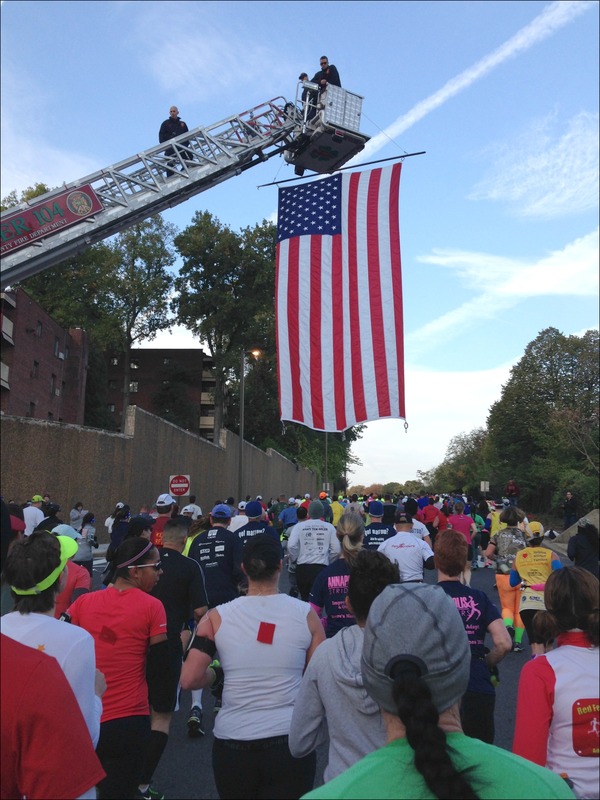 I had heard such legends about the Marine Corps Marathon final hill to the finish, that in my head I think I had made it out to be Mount Everest. I put my head down and charged up the hill. Looking down at my watch I realized the seconds were ticking towards 4:35 – a time I’d be more than happy with – so I looked up to see how far I actually was from the finish line and I was startled that it was literally about 100 feet from me! 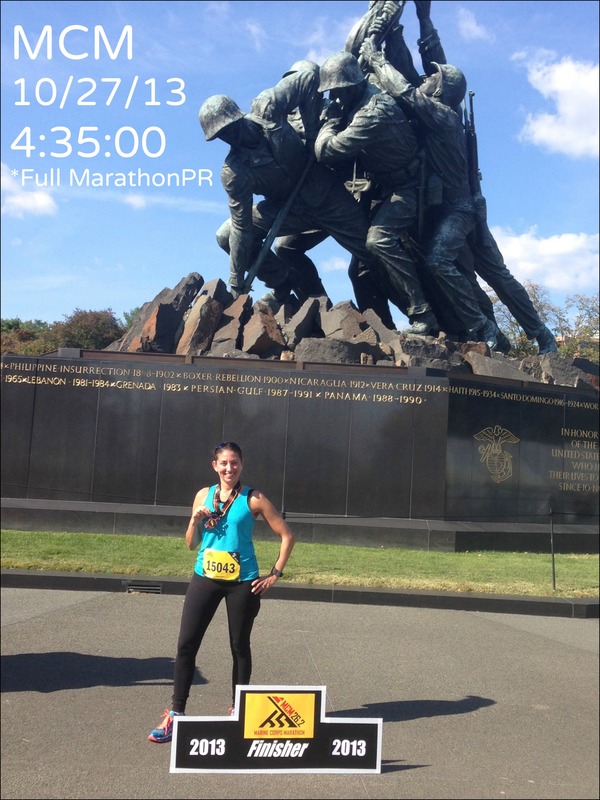 I got my medal, took a photo up by the Marine Corps Memorial…. …and went to collect some water and a jacket to keep warm and I literally bumped into Christine who finished just minutes behind me! Overall, I really can’t say enough about this race. The weather was perfect, the course was beautiful (and hilly! ), I had great company, and the support from the Marines was amazing. 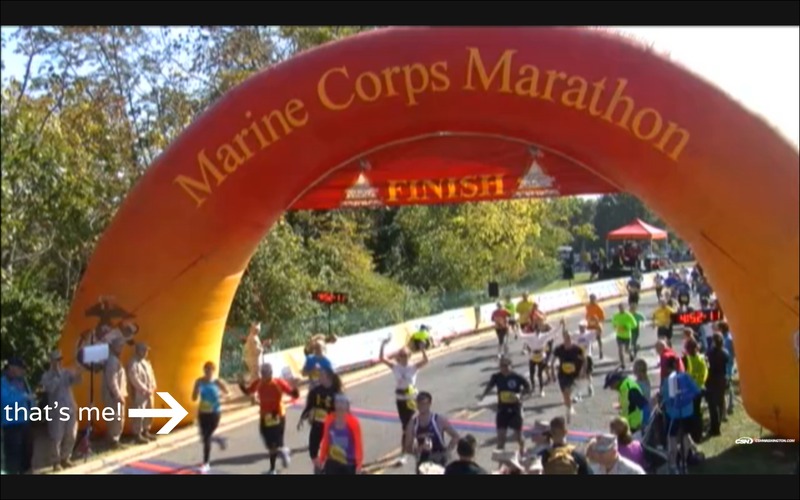 I wish I could count the number of Marines I high-fived during the race, or the hands I shook going through the finish line area. While I always do my best to thank the volunteers at any race, these thank you’s were different. The atmosphere on this course was different. Yes, these men and women were taking their time to support us through 26.2 miles, but with every “Thank You” myself and the other 30,000+ people out on the course said that day, we weren’t just thanking them for the water, or the Gatorade or the munchkin. We were thanking them for their service to our country, and that made this whole race experience not only different, but incredibly powerful. I just wish they had a water stop closer to the munchkin stop! I could have used something to wash it down! The munchkins have always sounded yummy. I’m sure at mile 24 I’d be willing to eat anything. Great job on the marathon! Haha, a munchkin wasn’t really all that appealing to me at mile 24, but I wanted to eat one just to say I did! Great job! Looks like an amazing race! It really was, I can’t recommend it enough! Great recap, and awesome to negative split like that! Thanks! I couldn’t have asked for a better day! Amazing. Chills, I definitely have chills. Congratulations! I can’t believe you ran a 9 min negative split. That’s AMAZING! I think the best I’ve ever eked out during a marathon was 2 mins and I was suffering dearly for it. You look great in that race pic! Seeing the photos of soldiers in action got me a bit verklempt too. I can’t imagine how moving seeing it in person much have been. Great job on an awesome race. This one is definitely still on my bucket list! Thanks Karla! The first half was really congested so I’m sure that accounts for part of the negative split, but I really felt strong the second half of the race and finally decided to really push it the last 6 miles – kinda wish I had started running harder earlier! That is definitely a race that I am putting on my wish list, I heard they are going to a lottery registration for it in the future. I made contact with someone who purchases and resells the bibs so I have someone to contact if I really want to get in. I want to do that and NYC and Chicago! Glad for the recap and wordy (as you may say), but I also like to relive the event by going back to my blog and reading what I experienced. It brings me back to that awesome experience! Yes, they are going to a lottery in the future, but the nice think about the Marine Corps Marathon is that they do allow bib transfers during a certain period (as long as they still do it in the future), so you don’t really need to worry about getting a bib through someone who re-sells them – you can “legally” do it right through Marine Corps. That being said there is always the charity bib option too! I may consider that next year if I don’t get in through the lottery! I remember wanting to jump up and touch that flag as I saw others doing but I didn’t want to injure myself. My pro photos don’t have the water mark. Haha yeah, I would definitely manage to hurt myself doing that! And the photos won’t have the watermark on them once I get the downloads that I paid for – this one is just “borrowed” from their website for now. I thought my proofs were blurry as opposed to having a water mark. I contacted mfoto and they appologized that they had lense malfunctions. I don’t see why they would offer me blurry photos. Oh, that’s too bad that your photos are blurry! I didn’t have a finish line photo at all which I was disappointed about so the one in this post is actually a screen shot from the finish line video feed! Oh wow! I went to the Marine memorial the next day and took a ton so I’m good. There were several finishers out doing the same thing. Aww, Erika, thank you so much for this sweet comment! Best of luck with your first half this weekend and please stop back and let me know how it goes! My best advice for taking on a full marathon is to wait until you really feel like you are ready to do it. Marathon training is a lot to take on physically, mentally and emotionally, but crossing that finish line makes every second (every blister, every ache, pain, and lost toe nail!) totally worth it! Thank you so much Jennifer! It’s been great following you during your training for your first marathon so far and if you have any questions along the way, please feel free to ask (not that I’m any sort of expert, but I’ve been through it!). 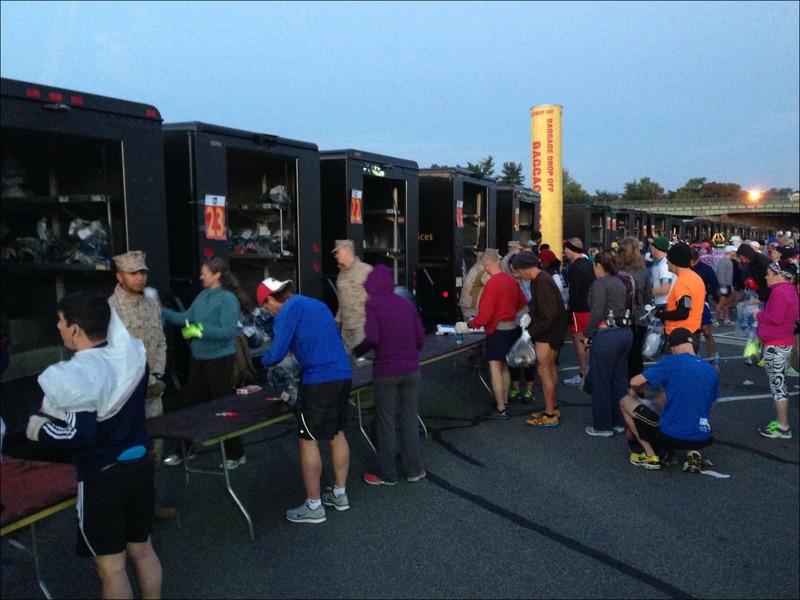 And yes, definitely make sure Marine Corps is on your bucket list – such an amazing race! 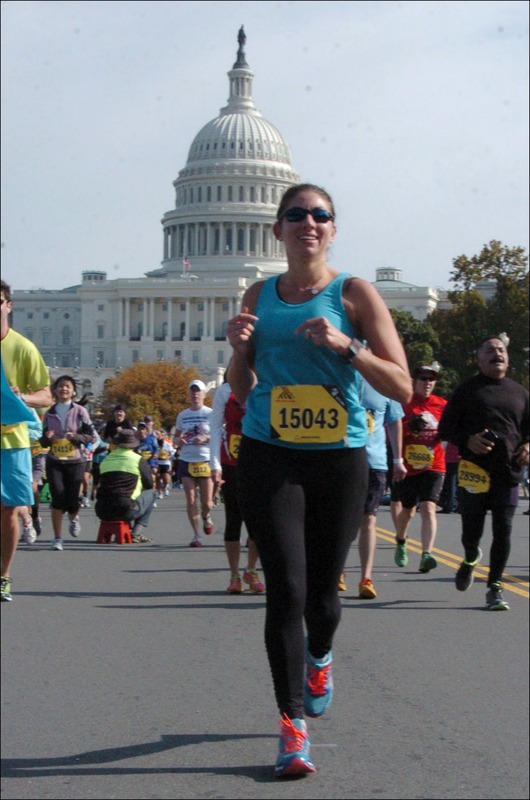 I was so happy to know that Christine had a friend to run with for her first marathon. She had such an amazing race thanks to you Danielle. Congratulations on a hiny new PR and for having such a fun and fabulous race. See you next week! Thanks Pam! Christine and I had such a great time – I knew we’d be past friends and what better way to bond than running 20 miles together! See you soon! Strong work! Nice recap. It really was a special race. Also, It was great to meet you before the race (by the UPS trucks). Hi John! It was so nice to meet you too, thank you for coming over and saying hello! I hope you had as good of a race as I did! Haha, I honestly thought about asking a Marine to stand there while I did a few pushups but then I felt kinda silly – I sort of wish I had done it though, that would have been awesome! Congrats!! A 9-minute negative split is AMAZING. I also ran MCM and finished in 4:33, but with a “positive split” of 13 minutes. (Uh, can you say “bonk”?) I wasn’t so much disappointed with my time as with my execution, which sounds like you did perfectly! To be able to run a great race and be able to enjoy it too — great job! Thanks Jen! I was very fortunate and did have a great race, I’m fortunate that negative splits come pretty natural for me and (knock on wood!) 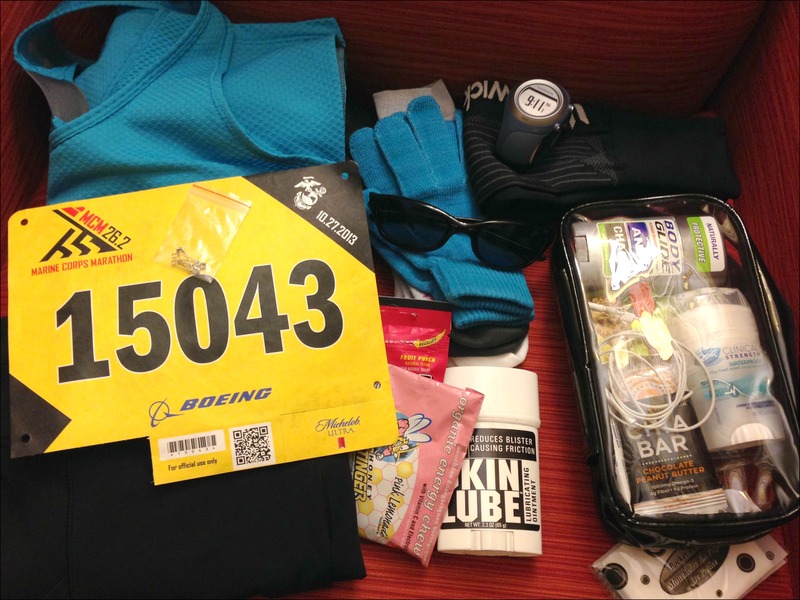 I have yet to “bonk” during a race – let’s hope I can keep it that way! Congrats that was awesome, a really great race I’m glad you enjoyed it so much. I love reading your recaps!! Congrats on an amazing race!! 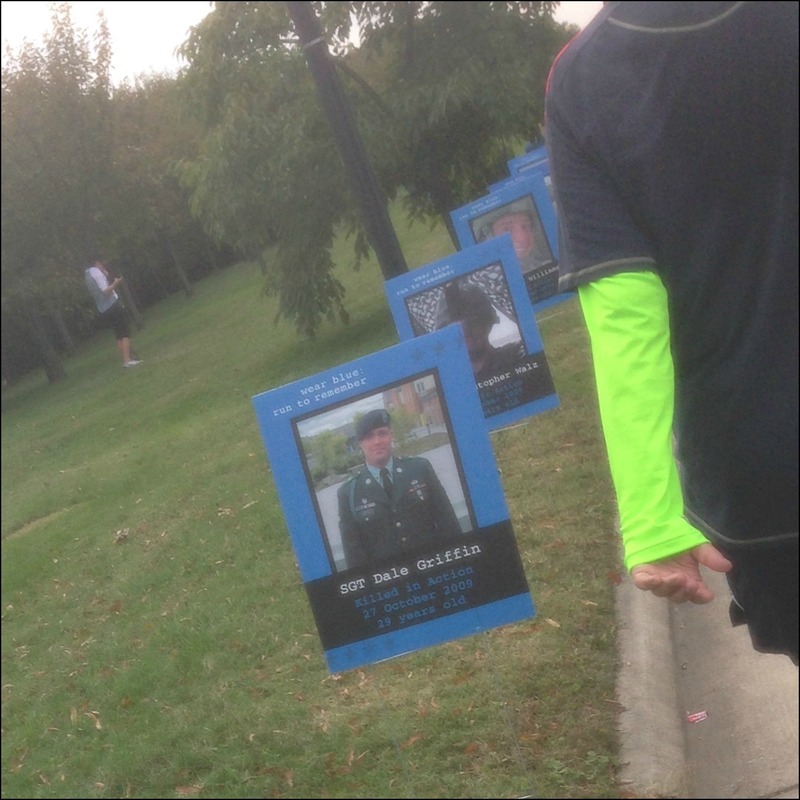 The Seattle RnR has a stretch where they have pictures of fallen solders and American flags and I start bawling every time – I can’t imagine the emotion of running that stretch during the MCM! You look so great and happy in your race photo. What an amazing accomplishment and how great that you were able to run the majority of it with Christine! Thanks Emily, it really was such an amazing race, I really hope to do it again someday. I never tire of reading Marine Corps recaps and maybe this time the interwebs won’t eat my comment! Loved seeing your on course photos. They brought back some great memories and it’s nice to have some of these to augment the professional photos. Congrats on that killer PR!! Love it!! Congrats, ma’am! 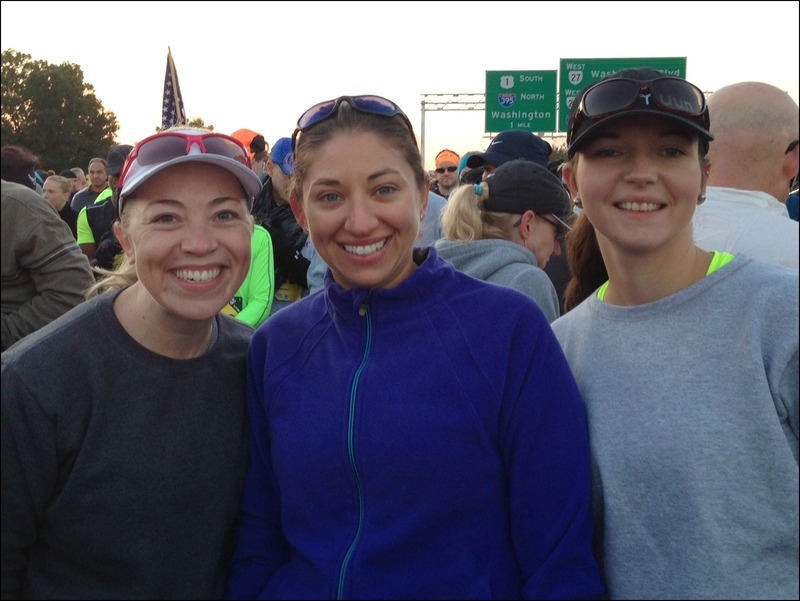 I ran my first marathon with 2 awesome ladies I had never met IRL. It was amazing!